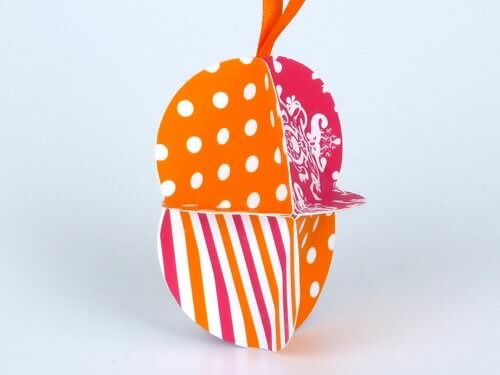 Sparkle up your Christmas tree with these easy to make Christmas ornaments. 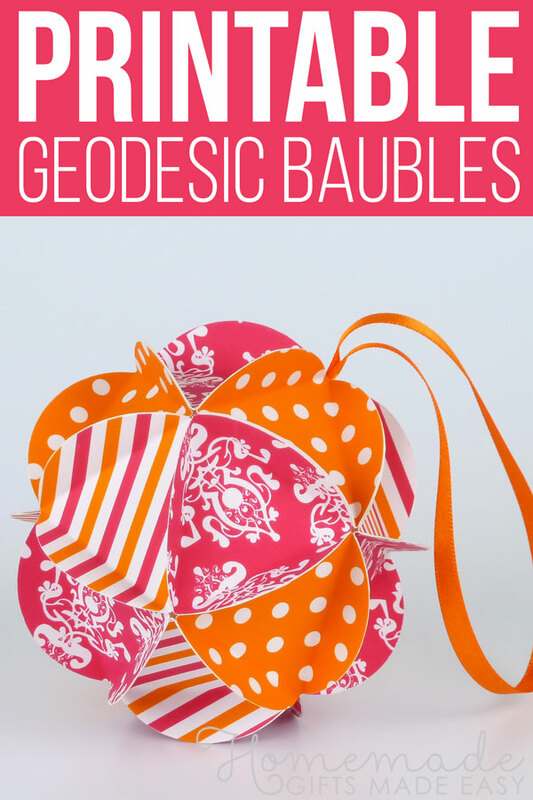 Don't let their intricate geometric design fool you... they're surprisingly simple to make! 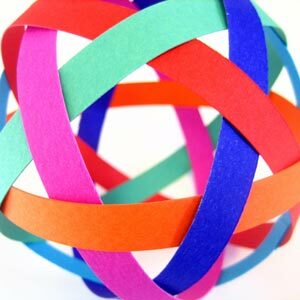 These homemade decorations are a great way to upcycle leftover pieces of scrapbooking paper into something beautiful. 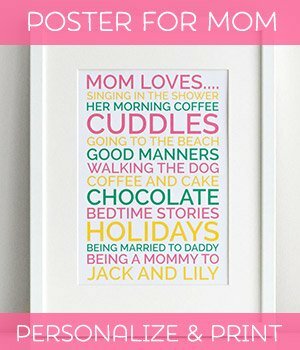 But if you don't have any scrapbooking paper then never fear because you can download and print my digital scrapbooking paper which I designed especially for this project. 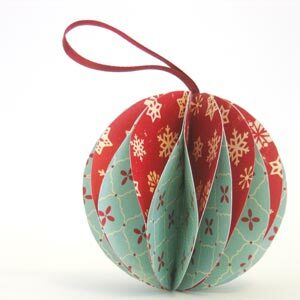 * If you use circles 1.5 inches in diameter then your finished ornament will be 3.5 inches in diameter. This digital scrapbooking paper is especially designed for this project, with the right number and size of circles to make your life easier. 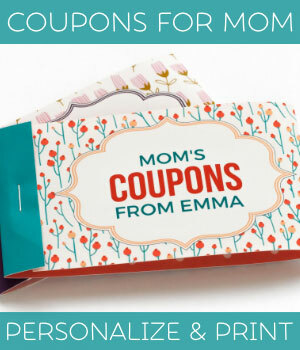 Printing onto normal paper works OK and printing onto card stock works even better. 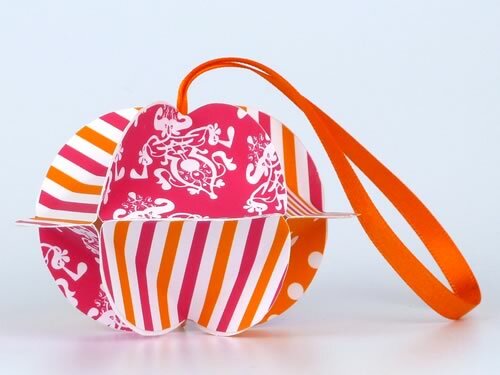 Cut out 20 circles of colored paper or card. Each circle should be about 1.5 inches diameter. 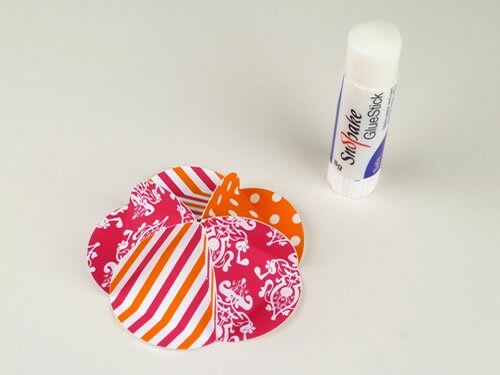 Use a circle punch if you have one, otherwise just trace around a big glue stick and cut out with scissors. If you're as perfectionist as my husband Tobias then you'll want to make sure that two colors never appear next to each other on the finished ornament. In that case you'll need to use at least three colors, with 6, 6, and 8 circles of each color. 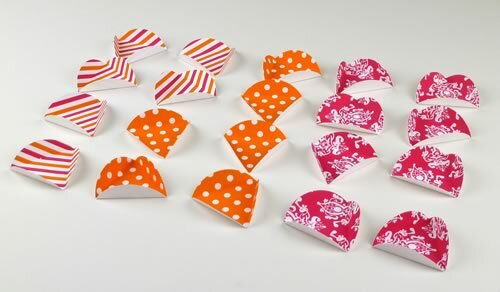 Option 1: If you're using my printable scrapbooking paper then cut out the triangle template and fold it into a triangle. 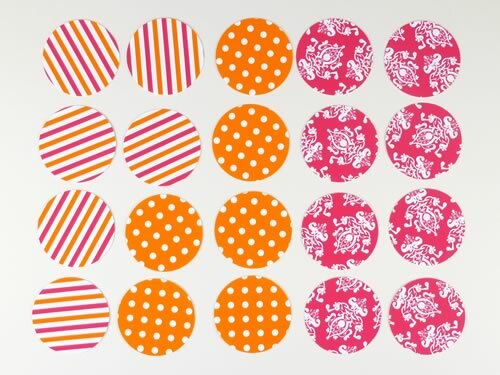 Option 2: If you're using your own scrapbooking paper, then cut out one extra circle (it can be from plain paper) the same size as all the others. 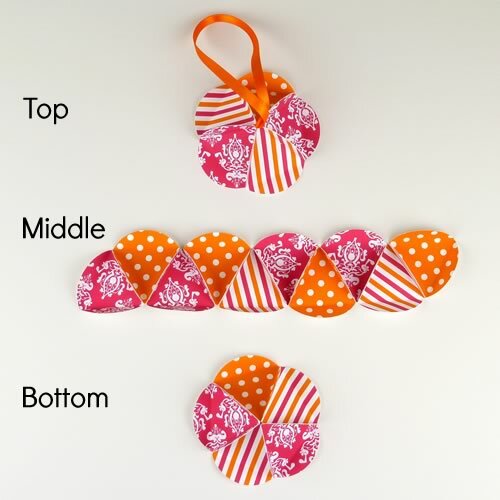 Fold it in half vertically and horizontally to make a cross-shaped crease. 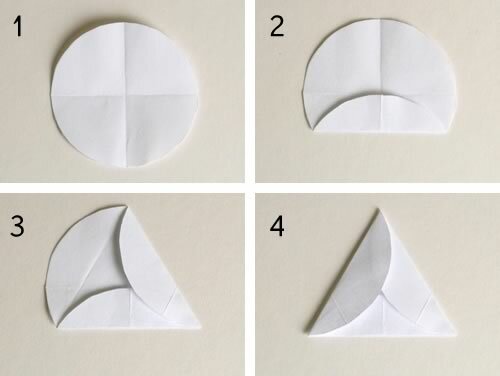 Then fold each side in to meet the center like this, and you'll end up with an equilateral triangle. 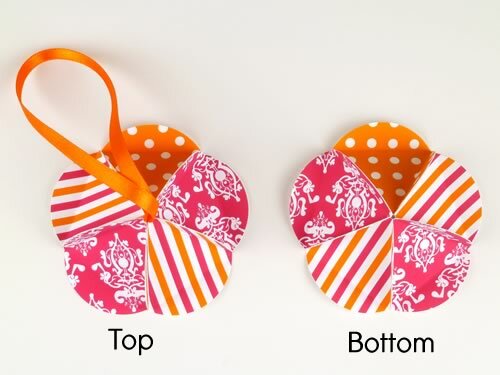 Place your triangle template on top of a circle and fold up the circle into a triangle. Repeat for all the other circles. Glue five of the triangles together to make a sort of "lid" like this. 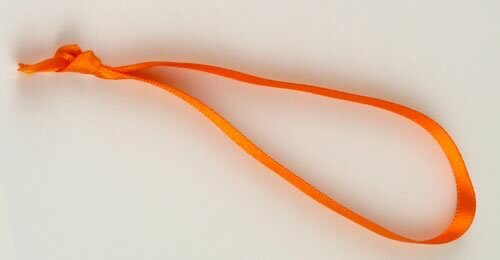 Cut a short length of ribbon, fold it in half, and tie a knot to make a loop. 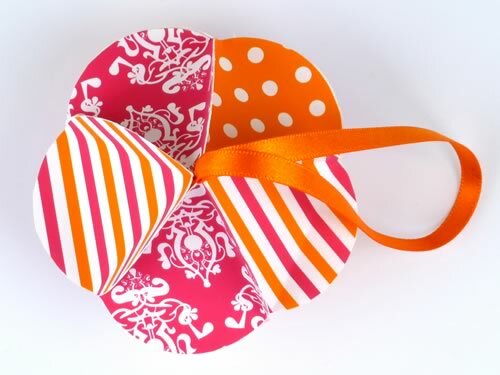 Use a pencil or other pointy item to poke the ribbon through the hole in the middle of the "lid". Pull the ribbon all the way until the knot stops at the hole. Glue another five triangles together to make the bottom of your ornament. Now you have a top and a bottom. If you're a perfectionist, make the bottom a mirror image of the top. 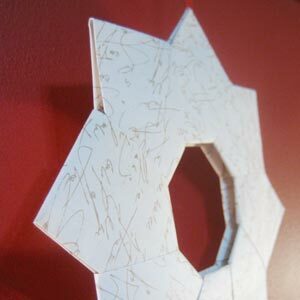 Glue 10 triangles together to make a long strip which will become the middle of your ornament. Final assembly time! 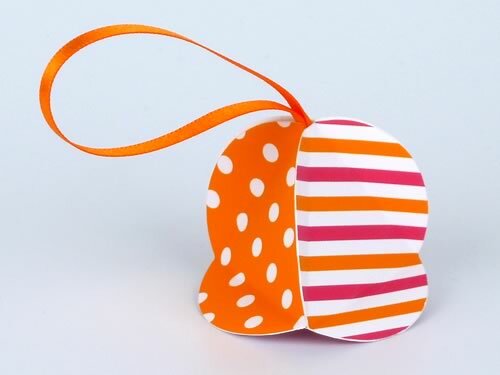 To finish your homemade Christmas ornament, all that's left to do is glue the top, middle, and bottom together. I like to do it in this order but you can do it however you like. Here's the finished ornament - isn't it pretty? How did yours turn out? If you have any questions or comments, or just want to say hi, please use the comment form below. 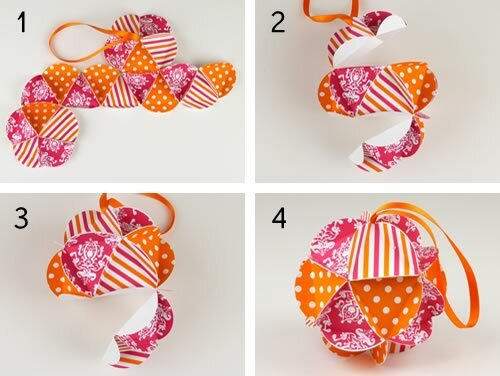 You can use the same idea to make ornaments with 4, 6, 8 and 10 sides. 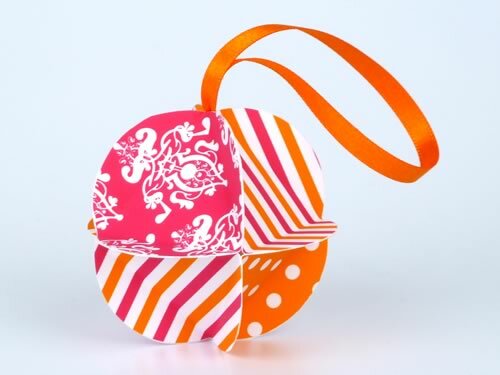 Once you've made the 20-sided ornament you'll find that making any of these other shapes is a cinch. 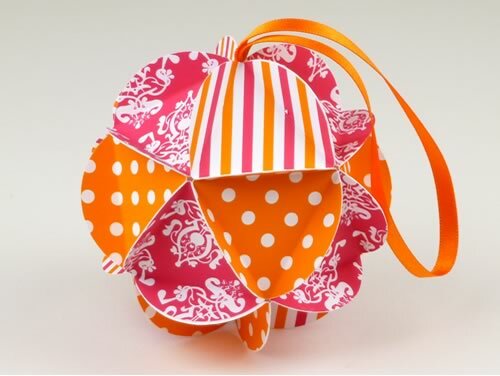 6-sided ornament - it looks a bit like a peanut, don't you think? 10-sided ornament - a multicolored tomato?